Not far from Grand Rapids, off a four-lane causeway, Frederik Meijer Gardens welcomes visitors in a low-key, mid-western kind of way. Founded in 1995, after more than a decade of planning and fundraising, the 132-acre garden and sculpture park still has a great deal of room to expand its collection. Meijer Gardens is the kind of place that exudes comfort in its mission and daily fulfillment thereof. It is at once a tribute to its founders, Lena and Frederik Meijer, founders of the successful big-box chain that has nested quite comfortably in the Great Lakes states despite encroachments from its southern cousin, Walmart. It is also a place for families to come together to walk through a horticultural landscape, enjoying evocative, but not overly challenging sculpture, and for those cash-cows of the museum/library/aquarium/garden world, weddings! 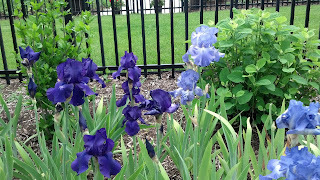 I visited Meijer Gardens on a hot and breezy Sunday afternoon in May. 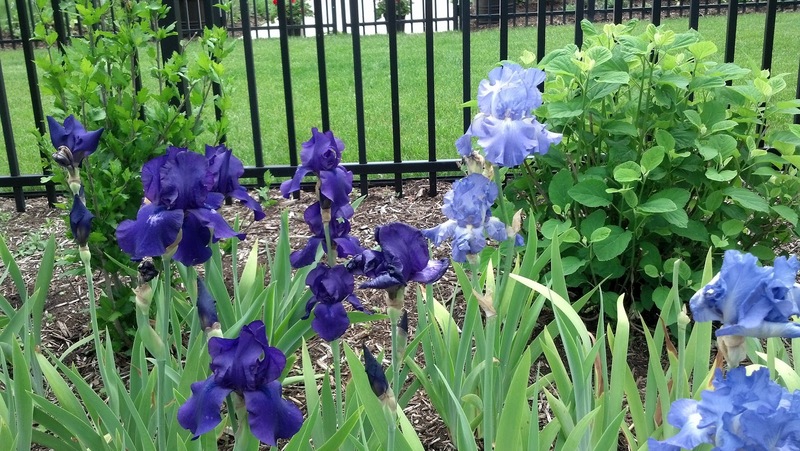 Irises were still in bloom, but the hot weather had propelled them a little past their prime. The highlights of our visit were probably the section of preserved wetlands, traversable by wooden boardwalks, the children's garden, the impressively large "American Horse" sculpture by Nina Akamu, and a giant stainless steel neuron set within a grassy meadow. In the wetlands, an experienced birdwatcher alerted us to ducks, red-wing blackbirds, and an abundance of turtles and frogs. We adopted him as our guide and joined a group that included two delighted young girls who exclaimed every time they encountered a new frog on a lily pad or mossy log. After taking an air-conditioned break to view some of the indoor botanical gardens, we headed straight for the "American Horse" sculpture we'd heard so much about.The "Horse" by Nina Akamu is a replica of a Leonardo DaVinci monument that had been destroyed 500 years ago. 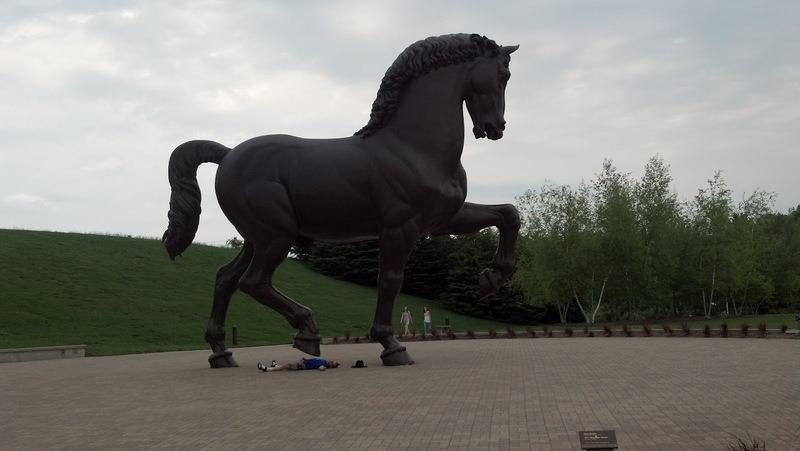 Akamu became part of a project to replicate the 24 foot tall horse in Milan, Italy, and with financing from Frederik Meijer, in Michigan as well. We were a little bit skeptical at first, because the idea of a horse-sculpture seems common, or even trite. But it's pretty impossible not to be impressed by a 24-foot horse with a front hoof raised high, holding a kind of powerfully destructive potential energy. Next, we made a sweep of the actual sculpture grounds. Here, I was impressed by the utter lack of density. There were people there, and even a wedding photographer preparing for an event that would happen later that evening, but we could feel almost alone as we encountered sculptures tucked behind trees or across ponds. We almost missed the "Neuron" by Roxy Paine. 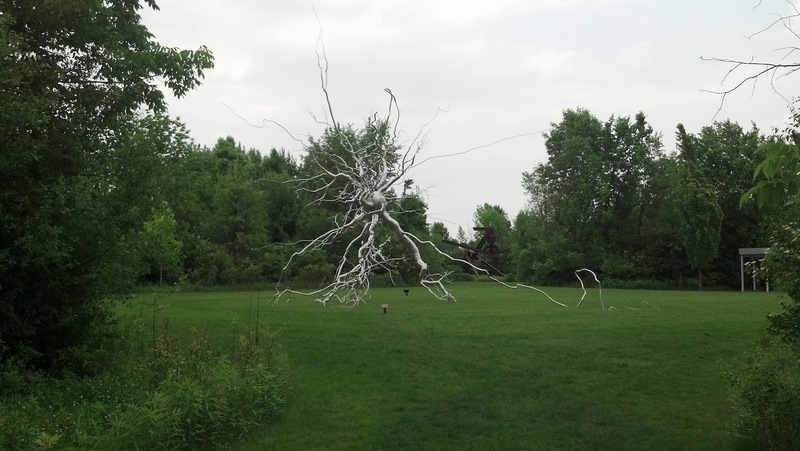 Looking at that sculpture, I felt that a neuron is meant to exist just like that, made of metal, in a meadow in Michigan. Meijer Gardens is the kind of place that doesn't seem to require narrative. It can exist as a simple, living work of philanthropy, a legacy to its chief benefactors, and also a place that has room enough for visitors to create their own memories. Unlike the Henry Ford, Meijer Gardens is less about the vision of the Meijers than it is about sharing beauty with future residents of Michigan and the world. That's an attitude I can certainly respect in a philanthropist.